Today I'm drinking Ten FIDY Imperial Stout brewed by Oskar Blues Brewery in Longmont, Colorado. This one happened to be canned on 10-11-10 at 15:21. The date stamp also includes the phrase, "ROUND 3, DING! DING!" For me, it's only Round 2, as this is a repeat from early last year. Around the rim of the can are some other words: "Cross-eyed. Cyclopean. Cancupiscent. Half-Baked. Fully Roasted Ale." Finally, "this dog'll hunt." Very bold silver and black can design. Rich, luscious chocolate aroma. Just a hint of vanilla and licorice there too. Chocolate and caramel flavors get you started, sweet but not too sweet. The 10.5% alcohol really cuts through and softens the sweetness, while also providing some serious warming. Coffee flavors are also prevalent throughout. Vanilla nuances, some fleeting licorice and perhaps even a bit of wood round out the flavor profile. 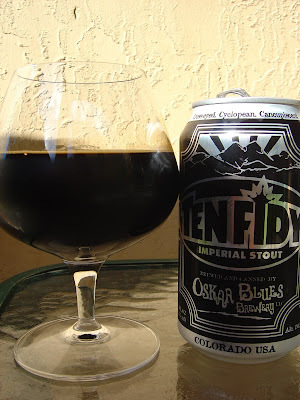 Extremely smooth, velvety texture, Ten FIDY completely covers the inside of your mouth. Excellent beer, a sipper all the way. Go grab one! As I have stated before, i think this is the best stout out of a can, one of the best stouts overall. Easy to get in trouble as it goes down way too easy. I agree with JayZeis. Ten Fidy is one of the best stouts around. So smooth for a 10.5% abv brew. Love it! And I agree with both of you! Terrific! Rob - I can't agree with you, JayZeis and Beer more - absolutely the best stout in a can and so very smooth and delicious. Here's a Ten Fidy review I did a white back, in case you're interested. Sorry it took 4 hours to approve that comment, Hannah. I had to temporarily turn on moderation to kill a nasty spammer leaving over 50 identical nonsense comments. Going to go check that out now! This beer changed my life. It was the beer that made me realize great beer was available in cans. Hey Lost. Great beer! Can and all!